Tune: "Give Me That Old Time Religion"
A sig-nal he would give . And you will sure-ly live. And you must run and hide. And then the friends both cried. For that's what good friends do. For God was with him too. Print lyrics "Give Me That Old Time Religion"
Hear the tune "Give Me That Old Time Religion" African-American spiritual. 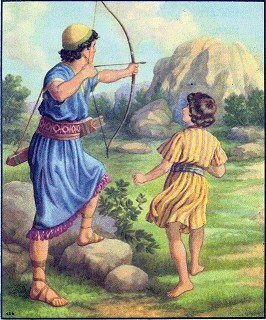 Press "Go" to search for books about David and Jonathan.